Artistically perfect artefacts can be produced only by perfect technical means, and in historical textiles pattern, colouring and structure are harmonized and strictly interlinked. To make these magnificent and lasting carpets, the craftsmen had to use highly elaborate methods of weaving, incorporating a perfect balance between the thickness of the warps, wefts and pile threads, the knot count and the pile height. The precise combination of these factors helped the Chinese master weavers to produce carpets with complicated patterns and great strength, so that after hundreds of years of intensive use these creations of anonymous artists still radiate charm and beauty. Chinese carpets show amazing uniformity in their basic structural characteristics. All but one of the examples studied here are made with asymmetrical knots open to the left, with no depression (a few also include the presence of a row of symmetrical knots next to the selvages). A number of other basic characteristics are also almost universal. 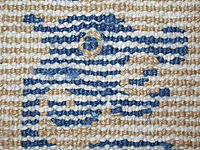 Two shoots of weft are generally used in a strand. Both warps and wefts are mainly cotton, either ivory or off-white in colour, and are usually Z-spun. In most cases the warps are plied, usually Z3S or Z4S, sometimes Z5S and Z8S - although the silk warps of the early Imperial carpets mostly have Z2S ply. Wefts are spun but mainly non-plied, Z3-Z4 in a shoot, though there are numerous minor variations. 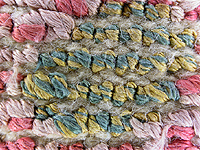 Although cotton is the main foundation material, silk and wool were also employed. Data on the structure of the threads can play an invaluable role as more information is collected and an attempt is made to arrange classical Chinese carpets into more precise groups. The clear uniformity to the basic technical features of classical Chinese carpets indicates a developed and stable tradition. This had variations over time and in different places, but these evidently originated from a common ancient root. Identification of further peculiarities, and especially of their variations, could help to find more evidence for the location of that root and to trace the direction of development and formation of its 'shoots', namely the different local centres of carpet weaving. The pile of classical Chinese carpets is mainly wool, very coarse in the early Imperial examples and relatively fine in the later pieces. Six of the sixty-eight carpets here have silk pile. The gigantic knots of the large-scale floor carpets were made by two main methods, 'large knots' and 'packing'. With all-over large knots each individual knot is asymmetrical and open to the left as normal, but close to a centimetre in size and with greater height than width. The pile yarns of the large-knotted carpets are made of coarse, shaggy, extremely thick and faintly Z-spun threads. Thanks to their thickness and tousling the knots sit firmly in the foundation, so the carpet stays strong and stable. For areas of curving floral or animalistic design, large knots were joined into sharing rows, creating a beautiful artistic effect. The number of techniques already mentioned is impressive enough to warrant regarding classical Chinese carpets not as a craft but as a high art of weaving. In fact the level of skill was even greater, and Chinese weavers used numerous other special methods to help them create their elaborate curvilinear, floral and animalistic designs. The complicated and original nature of the patterns suggests that the designers of the magnificent imperial 'knotted pictures' applied preliminary drawings directly onto the warps, similar to the warp-ikat technique. This method is still practiced in China, unlike many of the other splendid ancient techniques, which are lost. Regretfully this is a common picture: time- and labour-intensive arts need patrons, otherwise the most complicated skills and secrets die away. From this point of view the classical Chinese carpets of 1400-1750 should be regarded as masterpieces of knotted pile weaving, with individual techniques corresponding perfectly to individual designs of very different levels of complexity. 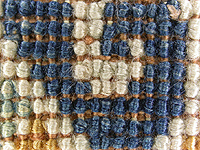 In spite of numerous common technical features the weavings examined here demonstrate some important differences, which make it possible to trace them to three separate traditions. 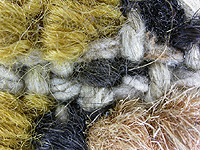 The first, the carpets of the 'Beijing' group, use a technically archaic system of weaving similar in many - if not most - methods to the knotted rugs dated to the Hellenistic and post-Hellenistic periods found in the Taklamakan desert and the caves of Afghanistan, and which are ascribed to the Bactrian carpet-weaving tradition. Characteristic technical features of this group include asymmetrical knots open to the left, a low knot count, all-over packing and the daring use of specific special techniques in very precise areas to achieve a particular design effect. The second group, attributed to Ningxia, show a clear relationship to an earlier Central Asian carpet-weaving tradition, of nomadic origins: these carpets demonstrate a more consistent style of knotting, with fewer irregular techniques and some different features. Over the centuries the patterns became more and more geometric and, unlike the Beijing group, the weavers increased knot density in order to represent animalistic, floral and roundel motifs. This Ningxia group includes rugs with silk pile, but other silk rugs, such as the Holmes saddle cover (no. 21), should most probably be ascribed to a third group. Several other important differences found in some of the carpets suggest the possible presence of other local centres, although many of these variations could equally be indicative of differences in time of production. To make any truly founded conclusions we have to continue to work on the information gathered here as well as collect as much precise data as possible on other carpets of the period. This, in combination with comparison with other carpet weaving traditions of Eurasia, is a practical route to understanding the true splendour of classical Chinese carpets.